Arcimoto three-wheeled, two-person, fully enclosed electric vehicle produced by a new EV start-up company in Eugene, Oregon USA for the urban commuter market. Arcimoto (pronounced arkee-moto) was founded in November 2007 by Mark Frohnmayer and is their first entry into the EV market. 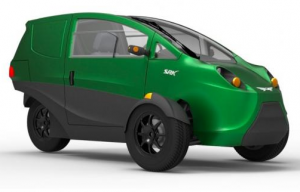 The SRK is their 5th generation version of the reverse EV trike which made it debut in April 2011. The 6th version will be produced and sold in very limited numbers (11, and four are already sold) there is also no official announced delivery dates. Version 6 of the BEVs are to take part in a pilot fleet test. Interested residents of the United States and its territories can reserve their EV for $100 online and expect to pay under 20,000 USD. Mass production is scheduled to start with version 7 of the vehicle.